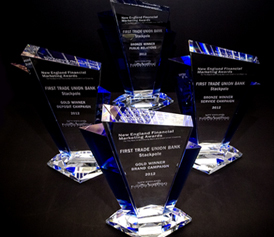 The Stackpole team is honored to have received two gold and two bronze awards for their advertising campaigns for client First Trade Union Bank at the New England Financial Marketing Awards Gala. The event was held on September 26th in the Grand Ballroom at the Sheraton Framingham Hotel & Conference Center. We are proud of the great client partnerships we have that enable us to do such great work and would like to thank First Trade Union Bank for the collaborative effort and their ongoing support that led to these award-winning projects. Several hundred people attended the highly-anticipated awards dinner, where agencies and financial institutions from across the region came out to support and honor each other’s achievements. The annual event was created to showcase the best in community bank & credit union marketing and included awards in both the general marketing and community involvement groups. Entries were submitted by category and evaluated on several criteria including Objectives, Strategy, Execution, and Results. Stackpole was privileged to share the spotlight with many of the area’s top financial marketers, and congratulates everyone on their success!